What Aboriginal Catholics & other Christians offer the future of this land. As Aboriginal people, we are spiritual beings by nature. I suppose that was God’s purpose. Our spirituality is so entwined with our culture, customs and lore, they cannot be separated and exist together. We have a deep respect for everything in our world. The land we consider to be alive; she is our Mother, our source of life. Without her we could not exist. All things around us, the animals with whom we have totemic relationships, the trees, rivers, oceans, insects and even rocks have special significance for us. We come from a world where everything is connected. Everything is as important as our selves. We did not think ourselves as superior to anything. All of our ceremonies, celebrations, initiations, rituals and renewal were all to thank the Creator Spirit, to pay respect and to express our gratitude. These ceremonies were linked to our pride and dignity as a clan or tribe. We are a humble people. We worship the Creator Spirit. Our customs and lore gave us an orderly, strict lifestyle that complemented where we lived and enabled us to survive for over 60,000 years in peace and harmony, with no need for fences, buildings, shops, police or even money as the Lord provided everything we needed. When Europeans arrived we did not understand the concept of private ownership; this was an alien thing to us. We are basically a peaceful race and had no idea what was about to happen. When we were moved off country we had lived in for thousands of years, the places that had been handed down through our bloodlines for EVER, we collapsed in a lot of ways, especially spiritually. So when we learned of the story of Jesus from the missionaries, we understood. We related to the story of persecution, of being in a helpless situation. We gravitated to these teachings because they were also beautiful stories of faith, of hope and of love and acceptance. It is what we were looking for. We are growing stronger in our spirituality and our faith, but it has taken a long while. At the Aboriginal Catholic Ministry we are endeavouring to walk a path that we are creating as we move forward. That is what gives me the strength and courage to continue on the unmade path in the journey of the Aboriginal Catholic Ministry, to continue to follow our founders’ dreams. They carved such deep tracks that I am honoured to follow and also to create new ones, continuing to teach others about Aboriginal people, culture and faith in the hope of changing the current order and working for Reconciliation with those who believe we can find better ways forward. We can’t do this on our own unfortunately. We Indigenous peoples are now a minority in our own country. We have no prominent voice and in many ways we are still invisible. So the more people we can educate about the longest continuous culture in the world, the more support we can build, the better things will be for our descendants. That is my dream as we continue to carry the flag, even though at times it is way too heavy and I falter. This is my chosen path and I believe it is part of our mission as Aboriginal people for the future of Australia. 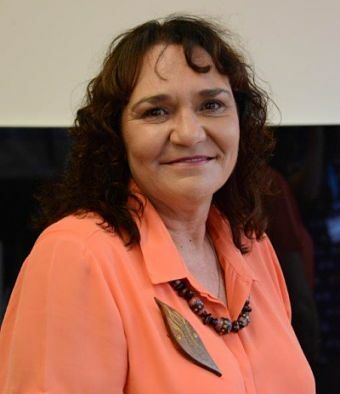 Sherry Balcombe is Co-ordinator of Aboriginal Catholic Ministry Victoria. 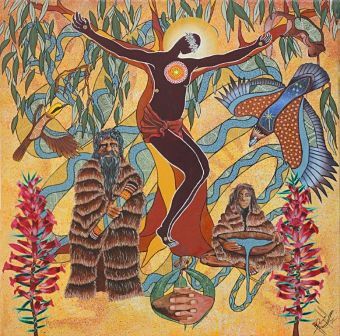 Thanks for this beautiful reflection on Aboriginal spirituality. It is inspiring and encouraging. Sherry, this is a beautiful reflection from the heart of this ancient land. Keep reflecting, keep writing and keep carrying the flag. It may be heavy now, but it will become lighter as the journey unfolds. Thank you!